Grow Up is an Adventure, Casual and Open World game for PC published by Ubisoft in 2016. Ready to have new adventures after Grow Home? You will take the control of BUD for another time. When this little robot was traveling, His spaceship got crashed so hard. Now, You have to help BUD find the parts of that spaceship on different environments. First of all, The players have to learn how to control the main character. It won’t take more than some minutes to learn it perfectly in Grow Up. When you finished the tutorial, Your main adventure will get started. You should search the areas carefully to find the lost items. BUD has abilities in some fields such as climbing and running. But these abilities should get improved in the future to finish the levels successfully. As you can see the game’s genre, You’re free to explore the areas without any limitation. It means that roaming freely in the environments will be your first enjoyable experience in Grow Up. BUD’s life will get into the danger for many times. Although he’s a robot, He wants to live for many years like the humans! That’s why you have to protect him against the dangers. The most important skill is jumping. You can improve this skill to jump over the obstacles within some seconds. 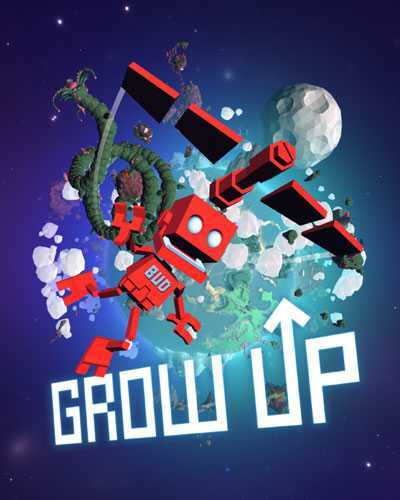 If you have experienced Grow Home before, It’s time to complete that experience by playing Grow Up. This new version is much enjoyable than the previous one. Because the developers have used their experiments to make a better game. 18 Comments ON " Grow Up PC Game Free Download "
Yeah, I just ended up buying it. Thanks for that. do i need a winrar ? well, i just installed my new computer on my windows xp i had lying around, and on my brand new computer with 512 mb or ram and just to find out my video ram that has 80 mb didnt have enough to run!!!>!?!?!?!!?!?!?!?!!?! THIS COMPUTER WAS 500 DOLLARS OF OF EBAY!!!!!! I HATE THIS WEBSITE AND WILL NEVER COME BACK!!!!!!!!!!!!!!! you are a f*cking dou*hbag. This isnt the websites game you retard it’s a fuc*ing game on steam that cost money. this website provides cracks for these games. and really a 500 dollar computer you expect to be good? what a retard. i cant open it why? how come i can’t play the game? it brings me to steam instead. why i can’t play it? it brings me to steam instead. There are some game downloads along this website that give us a white page, no folder actually, i tried to search for a solution didn’t work. Is there anywhay to fix it ? For all you with trouble, in the rar that you download is a crack folder. copy that to the place you install the game. not to hard is it?